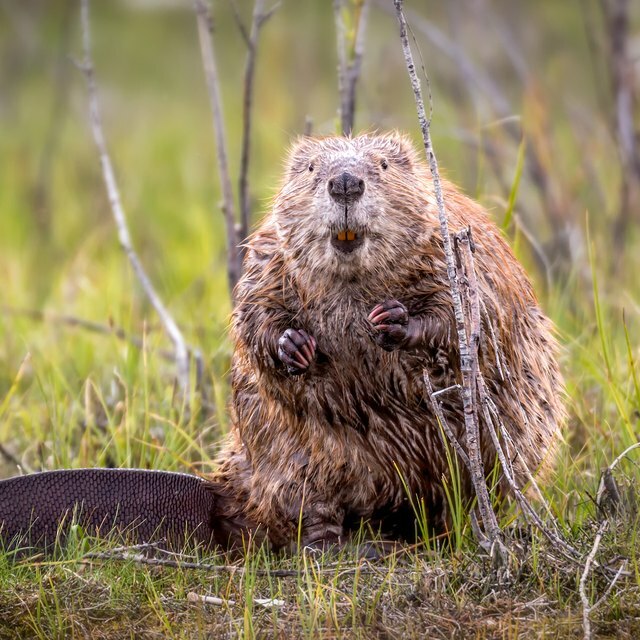 What Adaptations Do Beavers Have to Survive? The beaver is a mainly nocturnal, semiaquatic rodent known for building dams and lodges. The animal has many adaptations that aid in its survival and its ability to live in the water. These adaptations allow for their survival but also limit the habitats in which they can live. The beaver's wide flat tail serves many purposes, including communication between beavers. The tail adaptation also stores fat, which acts as a heater in the cold months. In addition, beavers slap their tails on the water as an alarm and to startle possible predators when they dive into the water. The tail acts as a rudder while the beaver is swimming, while large webbed hind feet, helps propel them up to 6 miles per hour. The beaver's well-known big buckteeth are an adaptation that helps them gain access to food as well as dam and lodge-building materials they would not be able to get otherwise. The chisel-shaped teeth make it possible for a beaver to fell a 5-inch-diameter willow in merely three minutes. Beavers' teeth grow continuously, but the animals' gnawing keeps them filed down. In addition, the animal's fur-lined lips close behind the teeth, allowing for underwater gnawing and carrying branches. Beavers conserve heat in the freezing water with a thick layer of fat covered with dense underfur. They produce a water-repellent oil, castoreum, which they regularly comb into their fur with a split toenail, called a grooming claw. This adaptation keeps the skin warm and dry both underwater and in the winter. Beavers have several adaptations that help them in the water, aiding in survival. They have clear eyelids, which protect their eyes and help them see underwater. Valves in a beaver's nostrils and ears can close, keeping water out. The beaver has many adaptations that conserve oxygen, including large lungs, a big liver that stores oxidized blood and slow circulation to its extremities, allowing the animal to stay submerged for up to 15 minutes. Additional adaptations include the beaver's extremely keen sense of smell, which helps them not only detect predators but also identify relatives and find food. They also have dexterous front feet and adaptations that allow them to eat bark and wood. Kluza, Annie. "What Adaptations Do Beavers Have to Survive?" Sciencing, https://sciencing.com/adaptations-do-beavers-survive-8441466.html. 13 March 2018.